SUBHEAD: Whatever we manage to rebuild will get done locally. In victory, Dillary Clump may utterly cease to matter. 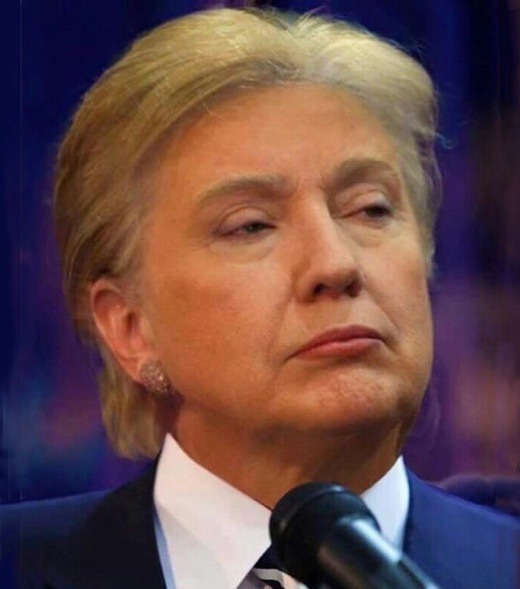 Image above: A mashup of Dillary Clump. An image trending on the internet. You'll find it if you look. Would fate permit it, the election of Hillary Clinton will be the supreme and perhaps terminal act in an Anything-Goes-And-Nothing-Matters society. Yet, even with the fabulous luck of running against a consummate political oaf, she struggles to get the upper hand, and she may land in the White House with the lowest voter turnout in modern history. And then her reward in office may be to dodge indictment for four years while the nation crumbles around her. This is the way the world ends: not with a bang or a whimper but with a cackle. Imagine the scene following Hillary’s election. In order to salvage the last shred of its credibility, the Federal Reserve raises its overnight funds rate another quarter percent and crashes the last Potemkin semblance of a “recovering” economy, that is, the levitated stock markets. Tens of millions of retired individuals previously driven into them by zero interest rate policy are wiped out. Even more gravely, pension funds and insurance companies are destroyed, but not before their troubles trigger derivative contracts with big banks which then explode and expose the inability of counterparties to make good on their ends of the bet. We’re now living in the setup for this, treating the election shenanigans so far as just another sordid television entertainment. It’s more than that. It’s an engraved invitation to the worst crisis since the Civil War. The crisis may even feature events like a civil war with identity groups skirmishing around our already-ruined “flyover” cities just like the factions in Aleppo and Fallujah. Thank the “Progressive” Left for that. Believe me, history will blame them for chucking the idea of a unifying common culture onto the garbage barge. And yes, for all our tribulations here in America, the rest of the world will be struggling with its own epic disorders. It remains to be seen whether they will lead to war as, say, the Chinese ruling party attempts to evade the crash of its own rickety banking system, and the inflamed millions of ruined “investors,” by starting a brawl with Japan over a few meaningless islands in the Pacific. Could happen. And, oh, is North Korea for real with its right out front nuclear bomb-and-missile program? What does the rest of the world plan to do about that? You don’t even want to look at the Middle East. The grisly conflicts there of recent decades are just a prelude to what happens when the House of Saud loses its grip on the government. That will happen, and then the big question is whether Aramco can continue to function, or whether the critical parts of it end up damaged beyond repair as competing tribes fight over it. In any case, the world will begin to notice the salient fact of life in that part of the world: namely, that the Arabian desert, and much of the great band of arid territory on either side of it, cannot support the populations that mushroomed in the nutrient bath of the 20th century oil economy. And they won’t all be able to self-export to Europe either. Speaking of that interesting region, around the same time Hillary sets up for intensive care in the third floor of the White House, the old order will be swept away across Europe. Farewell Merkel and Monsieur Hollandaise. Farewell to the squishy Left all over the place. Enter the hard-asses. You’d think if anything might unite that continent it might be the wish to defend secular freedom under the rule of law, but even that remains to be seen. Yes, the world following 3Q 2016 is looking like one hot mess. If you remember anything, let it be this: the primary mission of your cohort of the human race is managing contraction. The world is getting wider and poorer again and the outcome everywhere will be determined by the success of people to manage their lives locally. The big things of this world — governments, corporations, institutions — are losing their traction and whatever we manage to rebuild will get done locally. In victory, Hillary may utterly cease to matter.